People have been raving about the "delicious, authentic" Thai food at Cha Yen Thai Cookery since it opened in 2014. I attempted to go with some friends after a recent bridge tournament, only to discover the restaurant is primarily takeout; there is one table for 4, and a few high stools at a counter. My friends left for another restaurant, but I determined and waited in line for take out. When I finally reached the counter, they told me it was a 25-40 minute wait for takeout, so I gave up. 2 weeks later, I convinced my co-workers to try it for International Thursday. Luckily, the lunch wait was far more reasonable (10 minutes). 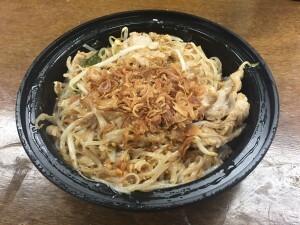 I had the pork pad Thai ($8.50). It was a solid rendition; the noodles were the right texture and the sauce was fresh, not too sweet. I liked the crispy friend shallots on top. My pork was a tad overcooked. I wish they had mango coconut sticky rice; I have been hunting for some since I got back from SE Asia. It's a fine option in the area, but not worth a 40 minute wait. Go next door to Sevan and pick up some baklava while you are there.